Adrian Blincoe came fifth in heat #1 of the 1500 meters today in Delhi, India and qualified for the Commonwealth Games 1500 meter finals. Another slow paced sit-and-kick race left the mad dash for the final 200 meters. Not surprisingly under such a scenario, the top six finishers all came home in a 1.2 second clump. The second 1500 heat went just as the first, with a very pedestrian pace producing a final lap sprint. Nick Willis, the reigning Olympic bronze medalist, advanced to the finals by coming fourth in 3:42.47. 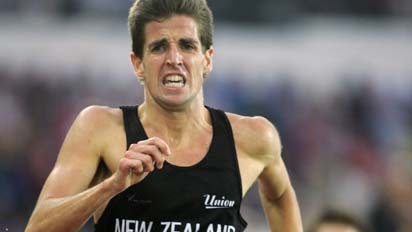 The Welshman James Thie is the only man older than Blincoe to make the finals. The final 12 men range in age from 20-year old James Magut of Kenya to the 32-year old Thie.